When life give you lemons eat some bacon or make some Limoncello. Limoncello is an Italian liquor infused with lemon and sometimes herbs. It usually is very sweet and easy on the tongue. We just so happen to have a Meyer Lemon tree that is bursting with Limoncello material. The Meyer lemon is a sweeter lemon. It may be a cross between a Mandarin orange and a lemon. What ever the pedigree we will be mixing it with vodka and letting it steep for a month or two. Once the initial soaking of booze and citrus a simple syrup will be added. Let's infuse! The recipe is very simple. 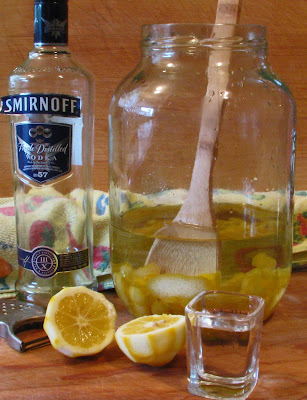 Peel some lemon zest, pour vodka, and let rest. I will refer you to a fellow Limoncellow enthusiast. Lee Ann for the recipe. 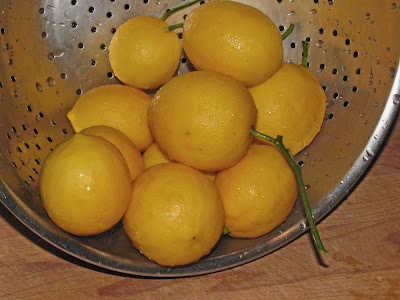 If you are using a Meyer lemon, have a gentle hand on the peeler. The skins are very thin and you do not want the pith. Gorden Ramsey yells at his underlings to taste everything. Why not? A taste test of the 100 proof vodka is in order. Here is my what happened. OH yeah! My brother inlaw makes this and a few other goodies. It's most excellent! We get cute bottles with corks in them as presents once in a while. He uses Everclear, 180 proof. Oh yeah baby! Sounds like fun! Please send samples when they're ready. Rev. You may get a taste but it aint goin to be in a cute bottle. Mason jar maybe. Zia, It is all about having Fun! highlandsranchfoodie, Did you ever consider growing your own. You could grow it in a container and bring it in when it freezes. Mason Jar is even cooler.